Take the stress out of cooking with the brilliantly stylish ZCV552GXC Gas Double Oven. 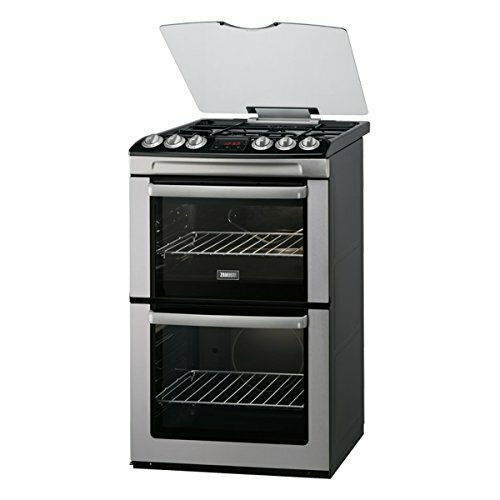 Its large capacity main oven is perfect for cooking multiple dishes at the same time, ideal for when you're looking to entertain while a separate conventional oven lets you cook or grill even more. Its 4 gas burners make use of Cast Iron Pan Supports, producing a sturdy frame for your Pots and Pans whilst also providing unrivalled control over your cooking. Easy to use controls make operating the Oven easier than ever while a minute minder ensures you never burn or ruin your room. For added safety the ZCG552 comes equipped with a Flame Safety Device. This feature cuts out the gas automatically whenever the flame goes out, meaning you never have to worry.